The State of Emergency Mapping Project has completed Phase 2, by extending the database from 16 to 21 years of coverage – the period 1995-2015. 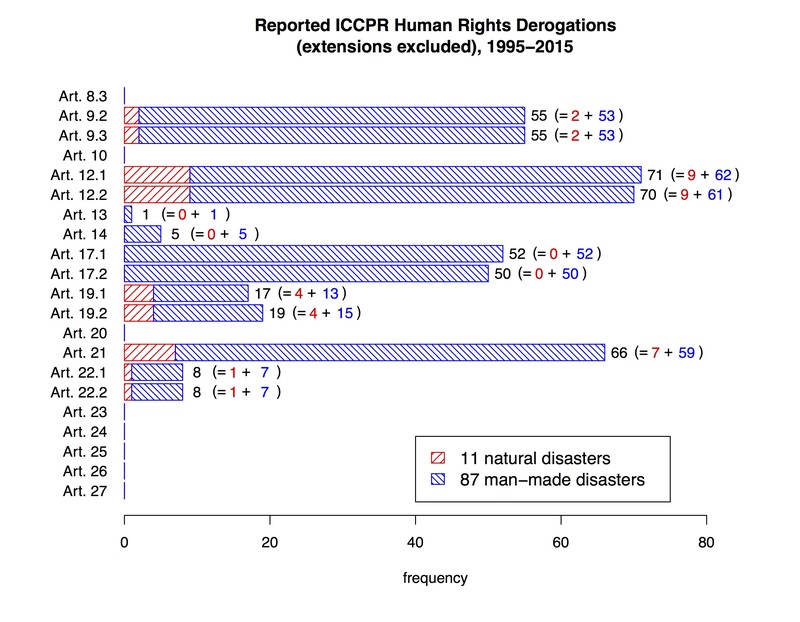 With more than 300 entries on human rights derogations, their causes, duration etc., this extended version of the original database provides deeper insights into the causes and effects of emergency declarations. Also the methodology has slightly changed. Given the UN’s effort to digitalize their archives, we were now able to directly access all depository notifications, rather than to rely on the annual reports of the Human Rights Committee (HRC). This added another layer of insight as the respective depository notifications usually give an insight into the reasons behind the declarations. The database is accessible as an Excel file. Furthermore, Dr. Leonard Fister, was lead data scientist in charge of data analysis and visualization of this second phase. The documentation and the underlying source code (R code) are available on the homepage as open source files (download links below) – for anyone to use, modify and extend the analysis to gain further insights. 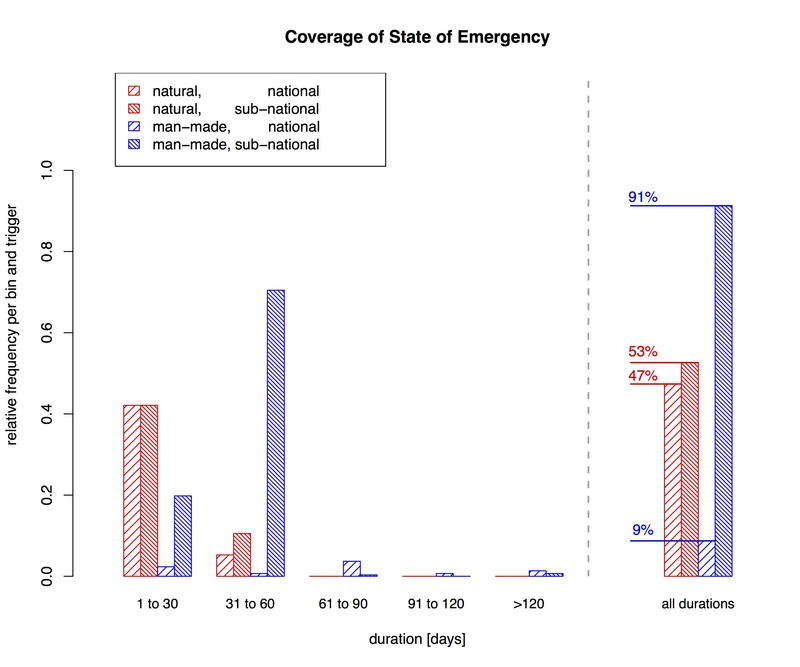 Excluding the extensions, 98 state of emergency declarations on the basis of Art. 4 ICCPR have been reported to the Secretary General and the HRC in the period between 1994 and 2016. 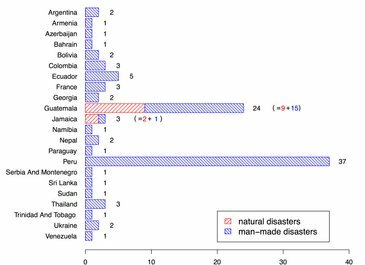 Man-made triggers dominate the state of emergency declarations (87 declarations); only 11 concern natural disasters (9 Guatemala, 2 Jamaica). 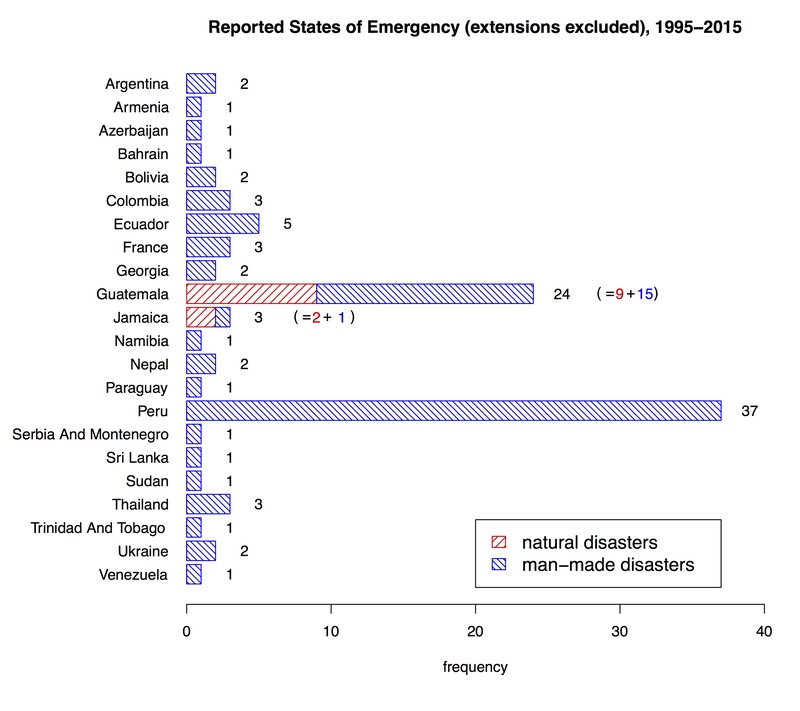 There is a big disparity between the two countries that most frequently derogate from human rights due to emergency declarations (Peru 37; Guatemala 24) and the other 21 states that have declared emergencies (between 1 and 5 emergency declarations each). The data also shows that Latin and South American countries are more ready to publicly report their state of emergency declarations. The countries known to declare emergencies internally for the longest periods or most frequently are not represented in the database at all (Israel since since 1948; Syria since 1963; Algeria since 1992; Egypt 1967-1980 and 1981-2015). Interesting insights can be derived from looking at the frequency of derogation of the specific articles of the ICCPR. Of all derogable articles, the following articles have never been derogated from: 8.3, 10, 20, 23, 24, 25, 26, 27. In addition, declarations for natural disasters have never resorted to derogations from: 13, 14, 17.1, 17.2. 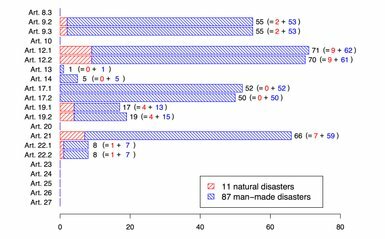 The most commonly derogated articles in man-made disasters (49<n<64) are in order of frequency (high to low): 12.1, 12.2, 21, 9.2, 9.3. Less frequently (0>n>17), states derogate in man-made disaster from the following articles in order of frequency: 19.2, 19.1, 22.1, 22.2, 14, 13. For SoEs of known duration, natural disasters make up only 6% of all events. They have a rather short range from 6 to 60 days, however, the distribution is peaked strongly around 30 days, as this duration occurred 14 times (when extensions of previously declared SoEs are counted separately). Both durations of 6 and 60 days were each seen twice, while once an SoE of 32 days was declared. Man-made disaster were much more common as they amounted for 94% of SoEs. The range of their durations has the upper limit at 4080 days, thus, it is much larger than for natural disasters, and also their unique values are much more diverse. The longest (different) durations are 4080, 1310, 456, 365, 268, 260, 107, 92, 90 days, followed by smaller values. A preliminary analysis shows that man-made disasters are much more susceptible to extensions and consequently long term durations as there were 87 original declarations and 211 extensions. When excluding the longest 6 events (3 of which extensions), the man-made SoEs show a mean of 52 days and a standard deviation of 19 days. 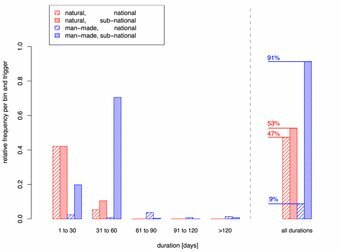 In comparison, the relative short term duration of natural disasters and their original 11 declarations and 8 extensions show a mean of 31 days with a standard deviation of 13 days.